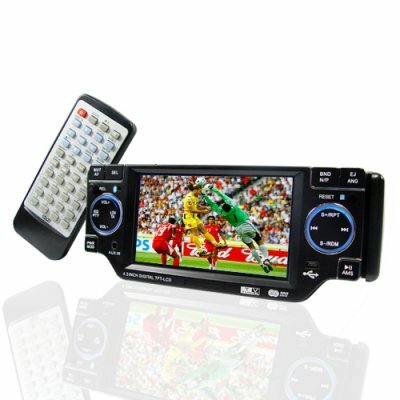 Successfully Added Superb DVB-T Single DIN Car DVD with 4.3 Inch LCD to your Shopping Cart. This fine single DIN car dvd is a great buy in this price range with many features including an excellent DVB-T tuner. An SD card slot and USB input add to your media storage options whilst the Bluetooth interface will keep you on the phone when you've got some serious driving to do. A simple frontpanel design is easy on the eye without trying to be the centre of attention and when you park up it's easy to detach at take with you for security. The best thing about this unit has to be it's excellent DVB-T tuner and interface - there's even an antenna with magnetic base included for quick and simple viewing pleasure. Buy today at our excellent direct from China wholesale prices with no MOQ and take advantage of our great dropshipping service to get products direct to your customers worldwide..